Please Note: I received money to purchase school supplies to take part in the Madame Deals Media Pay It Forward Back To School Event. It’s already back to school time and I know many of your children have already started school for the new year. My son starts third grade! I can’t believe how time flies. He’s growing up so quickly. I’m always torn when school starts back up. We always have a busy summer and I enjoy him with me each and every day. But it’s also nice for him to get back on a school schedule and for me to get more work done! I’m always so sad to see him go and sad when I leave him at school on that first day. Last year we were able to pay it forward to children in need for back to school so we were very excited that we were able to do it again this year. Besides being an excellent learning experience for my son, it’s such a great feeling to be able to help another child. Campus Book Rentals was gracious enough to sponsor this awesome Back to School Pay It Forward Event! They gave us $25 to purchase a backpack and school supplies for an organization or person. Eighty-five bloggers participated in this awesome event organized by Madame Deals Media. Changing the lives of at least 85 children… isn’t that awesome? We found a very special lady in our school district that also pays it forward in her own way. I believe that even if there is no cash or material things exchanged, you can still pay it forward and help your community. She has an adopted son and two foster children. How lucky these children are to have such a wonderful, caring person in their lives. When I contacted her and told her we wanted to help with school supplies she was beyond grateful. Like last year, I wanted to give back myself. We included money of our own to also assist with school clothes and I gave her cash to be able to go to the store herself and pick out some items she needed. One of the foster children was a twelve year old girl, so I knew she would want to be able to pick out some of her own clothes. 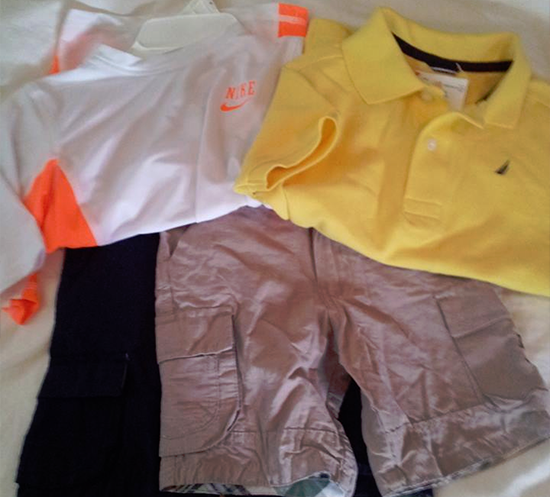 The two boys she has were smaller than my son so I also went through some of my son’s outgrown clothing and found some great back to school clothes for them that were gently used. I’m obviously not a coupon pro, but I tried to do my best at saving when I shopped for supplies. Honestly, I rarely use coupons. I can’t seem to find the time to sit down long enough to clip a coupon or coupon match. I would love to start using coupons. It’s silly to pay full price for items when I know I can get a better deal. I do enjoy shopping online and rarely buy something unless I can find a coupon code. I actually get a Sunday paper every week and save the coupons but they sit there until they’ve expired… Sad, I know. I spent a total of $21.17 on the school supplies with a very cute Disney Cars backpack. I could have gotten an off brand backpack for a few dollars. I believe in you get what you pay for so I knew I wanted to get this boy a backpack he would love that lasted him the whole year. His mom said he loved Bubble Guppies, Cars or Spiderman. I couldn’t find Bubble Guppies so I opted for the Cars backpack. Very cute! I also grabbed some clothes at Burlington Coat Factory. They were having some great deals when I was in the city. I got a couple of pairs of shorts and shirts for under $20. 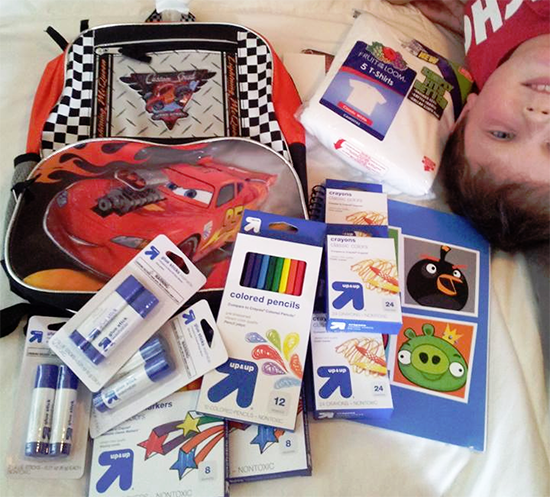 This Back to School Pay It Forward event was a huge success! We can’t wait to pay it forward again throughout the year and have another successful back to school event next year! That is amazing you were able to include clothing to donate with the school supplies as well! Great job! I love the Cars backpack, too. It feels so good when you are able to pay it forward to someone else, especially a child. I love this. I am so glad we got to participate in such a wonderful, feel-good event! !